They say design is everything and it certainly is the case for this beautiful wooden massage table. The minute it came on the market in 2012 I snapped one up as I had seen similar models in the USA before but they were too expensive to import. 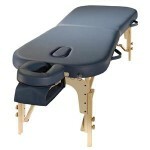 This is the massage table I used the most and I base it in my home treatment room. I then use my other lightweight massage table for mobile treatments. So why do I love it so much? It has a slight hourglass design so that it is extra wide in the shoulder and leg area where clients need it most but it tapers in ever so slightly towards the middle so that I can get in to the lumbar region very easily without the extra few inches getting in the way of my access. It is 30 inches at it’s widest and 26 inches at it’s narrowest. The slight incline to the middle is so gradual that it only really narrows where the clients waist is so the design doesn’t affect them and only adds to their comfort. 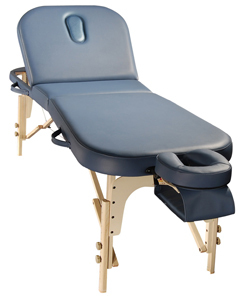 The design was updated in 2014 to include a breath hole inside the main section of the massage table itself whereas previously it just had the head cradle/face cradle extension. Now it has both so it caters to all tastes and treatment types as a lot of old school therapists are used to using the breath hole only. I personally find the head cradle an all round better option for both comfort and access but I think it is best to have both face hole options in any massage table where possible. 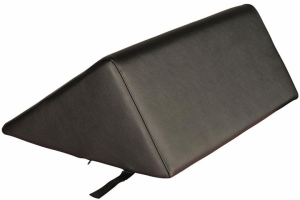 I don’t use a back rest and on the rare occasion it would come in handy, such as when I have an elderly client, I just use a triangular wedge bolster to prop them up after their treatment. But having a back rest is best for some therapists and treatments. In particular, reflexology, head massage, beauty treatments and when you have a lot of elderly clients or you simply want to prop clients up to get their bearings after a treatment. I guess the reason they decided to call this massage table “The Comfort” is because that’s exactly what it is! It does what it says on the tin!! The face cushion is even thicker than the foam on the main section of the table. It is 9cms thick and the shape is cut so it keeps clear of the cheek bones and eye sockets so it is very comfortable for the client to rest into. The end panels are easy access (a.k.a reiki end panels) so you can easily get your knees under when you sit on a stool. I only put my knees under and sit on a stool when I do a lot of neck mobilisation but other professionals such as reflexology therapists will be sitting and using this feature for the duration of the treatment. Check our my ratings below and if you have any questions leave me a comment.